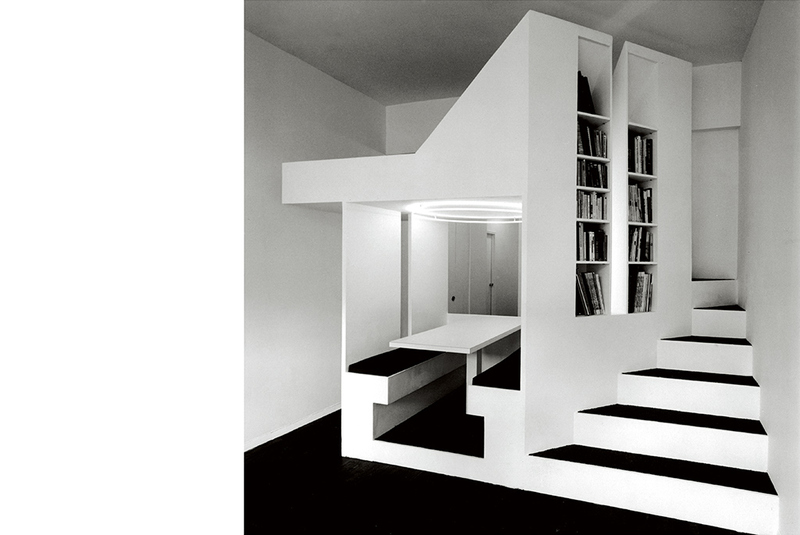 In 1976, George Ranalli Architect completed Ranalli Studio, transforming an ordinary 400-square foot studio into an iconic design, introducing the strategy of inserting habitable form inside existing space, since recognized for contributing to the new American apartment. An immediate success, the project attracted the attention of media publications such as Interior Design Magazine, in which the author explains, “The formal innovation for Ranalli Studio is considerably more complex in concept than meets the eye. The structure is a composition of two squares, with the cantilevered loft bed and the six-inches of space between the walls of the exiting apartment and the structure itself, constituting 1/3 of a theoretical square.” The result expanded one‐room into a city-dweller’s cosmos. The chalky two-level “construction” placed carefully inside an existing apartment in an existing building, incorporated a dining table, set on a slightly elevated platform, near the kitchen, and banquette-style benches, concealing neatly stored tableware below, as well as a cozy sleeping loft, and ample bookshelves. The form sculpts space behind for an entry foyer, and a tidy recessed kitchen and bathroom. It also carved out a view from the front door, across a narrow corridor of well-worn oak flooring, through to an airy living space, featuring large oakwood-frame windows and the cityscape outside. Above the dining nook, a delicate circular line of light charms the evening meal. Anchored by an arabesque of a staircase, flanked in alcove bookshelves, the upper level, cantilevered sleeping berth, also served as the canopy over the dining table. Translucent sailcloth, anchored to the top of the window frames, stretches across to the top of a tall handcrafted wooden desk, acting as both a diaphanous shade for the sleeping loft above, and a source of reflective lighting effects for the space defined underneath An interplay of reflection and shadow is further accomplished through the application of brighter white paint to the perimeter and ceiling, and soft gray on the facets form. The subtle lighting design is an early innovative use of glass filled with neon gas. 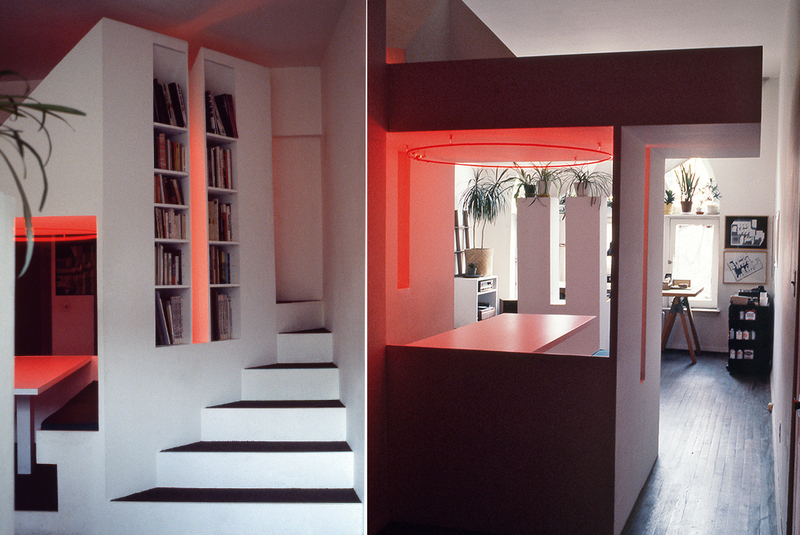 One circular, over the dining table, and the other vertical, in the bookshelf reveal, the custom designed fixtures impart color to an otherwise subtle white interior, and at night, the lighting effects transcend the simple display of their urban origins to create subtle and dynamic lighting effects. Living In One Room, Random House, by Jon Naar & Molly Siple, featuring George Ranalli Studio, p. 33.